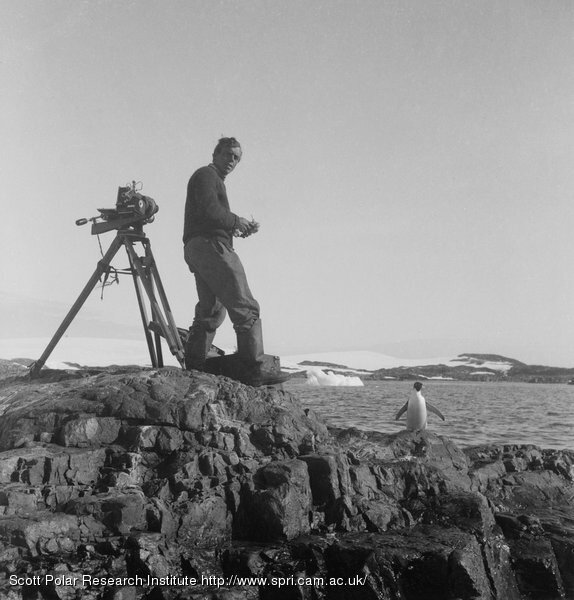 Summary text: Fleming stands on a rocky outcrop next to a camera mounted on a tripod. A penguin stands nearby. Sea and coast in background. This entry was posted on Thursday, February 5th, 2009 at 11:30 pm	and is filed under Photos: British Graham Land Expedition. You can follow any responses to this entry through the RSS 2.0 feed. Both comments and pings are currently closed.